Oh that title is sooooo cheesy, but it’s late & you get what you get at this point. 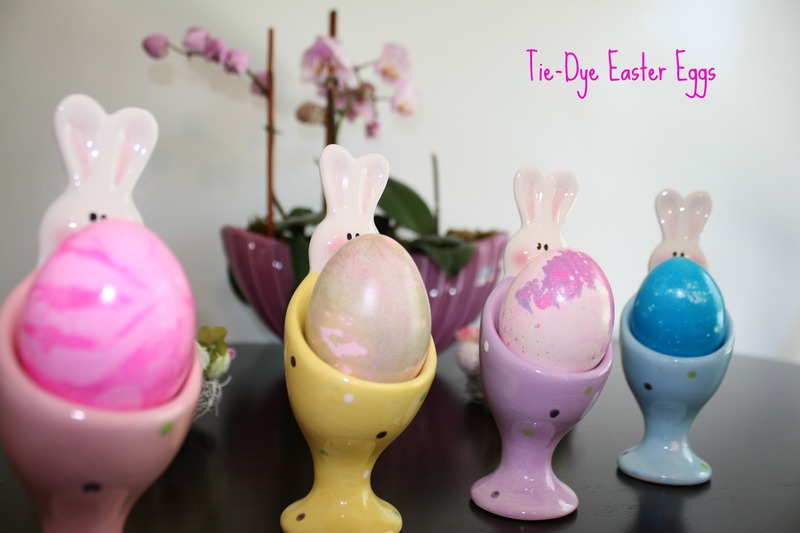 And by the by – this post has not been “proofed.” I still have to make a basket, hide eggs tonight, and gnaw out chunks of a carrot that The Boy left for the bunny. 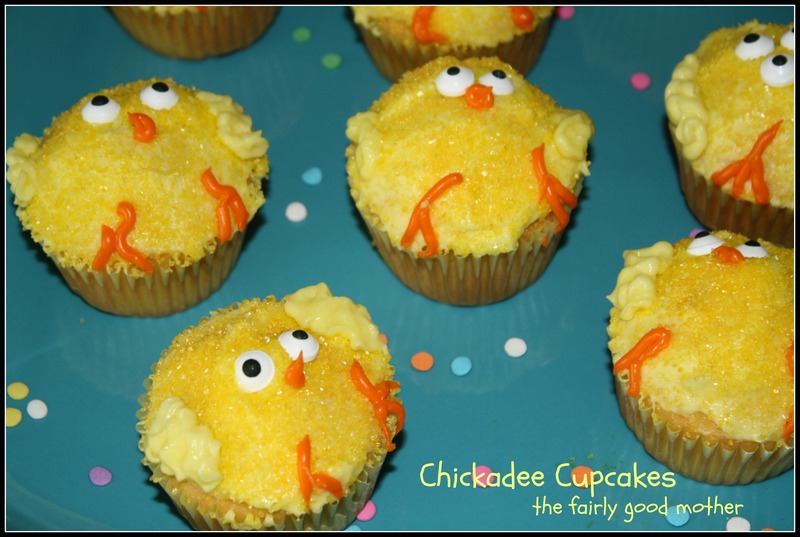 On Thursday, The Boy & I made Chickadee Cupcakes! I was inspired by this post. Mine are nowhere near as perfect & pretty as hers, but then again, I’m just a “fairly good mother,” so what do you expect? Let me see if I can impress you with this little tidbit of info: I did all of this WHILE working from home, juggling calls, making deals & doing laundry, AFTER running errands in the morning. Impressed? *huffs on knuckles & brushes off the shoulder dust* Yeah, I’m a badass mama sometimes. We took the easy route – got a box yellow cake instead of making from scratch, BUT I did make whipped cream frosting (my own concoction using heavy cream & powdered sugar & vanilla – don’t measure, just add to taste,) and then added yellow gel. I bought pre-made eyes & used some orange icing that was leftover from Halloween. It was Wilton’s – the kind in the air canister & it had a mind of it’s own, very difficult to deal with! I piped on some frosting to the sides for their wings. Note: You need to refrigerate these because of the cream frosting. Just let them stand at room temp for 15 minutes or so before you scarf one down. 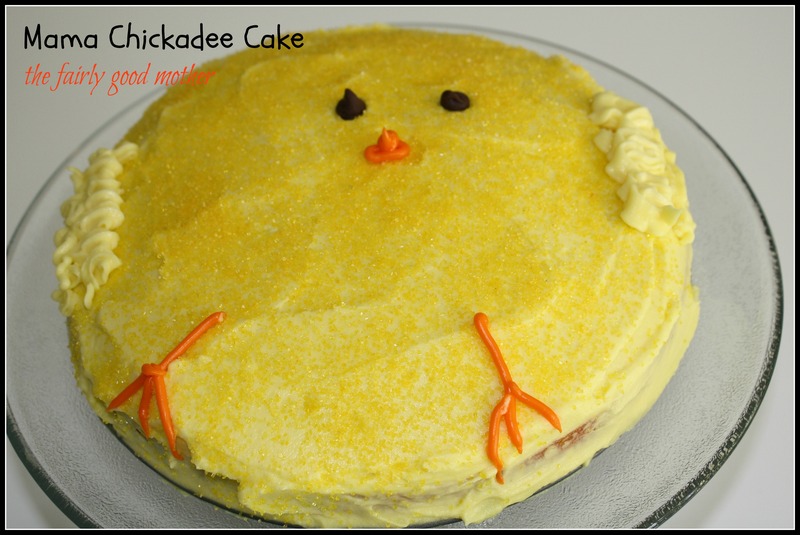 The Boy had fun making some of the chickadees into “silly chickadees” with one eye or three, and since I didn’t want 2 dozen chickadees, so we used the rest of the batter to make a mama chick. We used chocolate chips for her eyes & The Boy, my little choc-o-holic, ate enough chips to make 5 more chicks! We took some of the cupcakes to the neighbor kids & then went to karate. On Friday, we tackled the eggs! And let’s be honest here, it was a less than perfect undertaking. Take one rambunctious 4 year old, add 6 flimsy PAAS cups filled with colored water & of course your chances for a disaster are like 97% … Add to that the fact that I had dressed him in a new outfit that was partially white & the chances increased to 99.9999%. No worries, I’m a chilled out mama regardless of my self-diagnosed mild OCD. I had prepared for this event: laid out paper towels & put an apron on him. But two seconds after this picture was taken …. 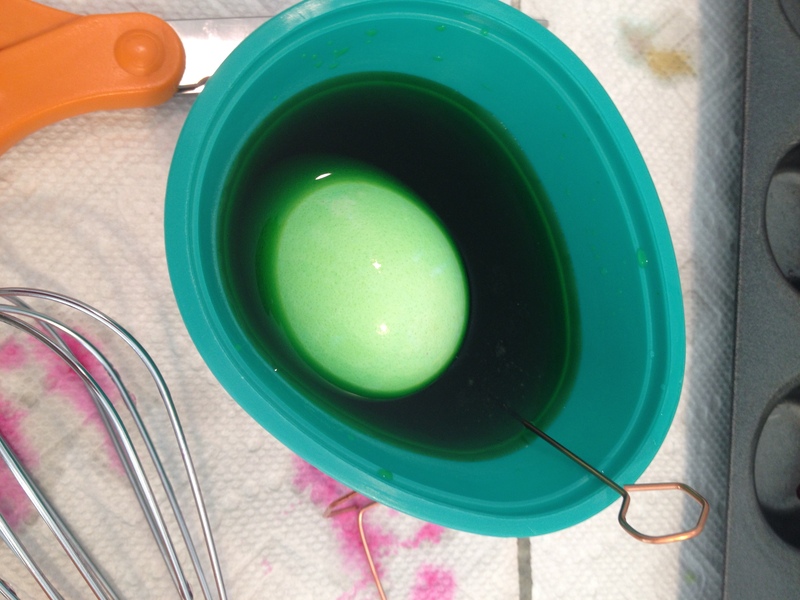 the green egg disaster commenced. Green will be all over the kitchen in 5-4-3-2 .. The Boy immediately freaked out & hopped off his stool to retreat in the far end of the kitchen. Before I even went to clean it, I consoled him. My little sensitive guy was obviously pretty upset that he had spilled the green all over the counter, cabinets & himself. “Guess what?” I told him … “Accidents happen & I’m not mad. I know I told you to be careful, but it’s no big deal – do I look mad? No. I’m not mad at all & it’s ok! Let’s take off your apron & get you a new one.” But he was still pretty shaken by the whole thing & ran off to his playroom. This was a great teaching moment (yes, those are actual real things for the fairly good mothers of the world.) I went to get him & we had a nice little talk about how important it is to forgive ourselves when we’re not perfect. I choked back my tears. Give me a break, friends, I’m PMDD’d & I love this kid. I got right down next to him & told him “hey it’s totally ok if you do it again … I might even do it this time! I’m not perfect, no one is. If we make a mess, we’ll clean it up! No big deal. Right? And listen to me … You know when a friend does something that makes you sad & they apologize to you & you say ‘I forgive you?’ well, it’s important to forgive yourself when you do something that makes you sad or frustrated.” He got that. And we finished the eggs. 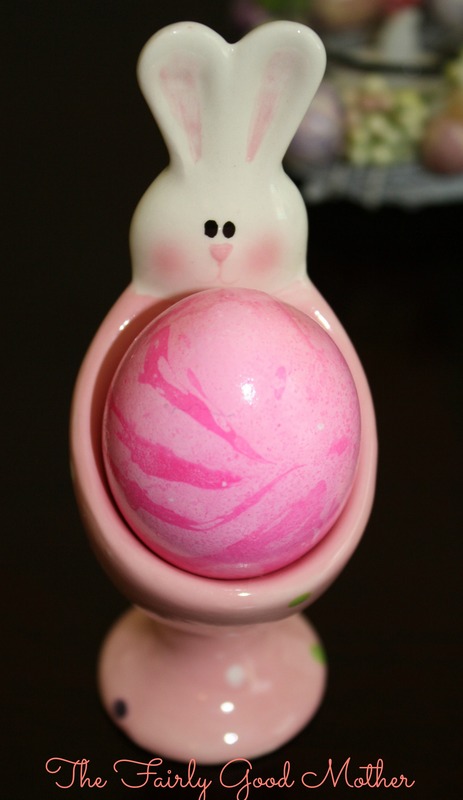 Or maybe it was the super bright pink egg that I did just for The Boy since it’s his favorite color & I knew it would make him happy. 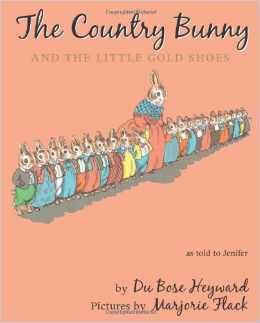 And we read this book before bed – one of MY childhood faves: The Country Bunny & the Little Gold Shoes. It’s about a Country Bunny who becomes one of the 5 Easter Bunnies. Was written in 1939 & still holds up seventy-five years later! I hope you have a great Easter, and I hope you can remember the wonderment you felt as you woke up on Easter morning to discover a basket filled with goodies & eggs hidden around the house. Childhood is a magical time where reality is kind of suspended … at least if you have fairly good parents who will do that for you. I hope The Boy looks back on his childhood and forgets the accidents & the struggles, and only remembers the magic, the wonderment, the joy of his life. P.S. Tell me that the addition of the text to my pictures was worth it! Thanks Picmonkey.